Catalogue Photos, add captions, descriptions, search images using keywords navigating directly within your photo collection stored on PC folders. How to create the IPTC photo database? 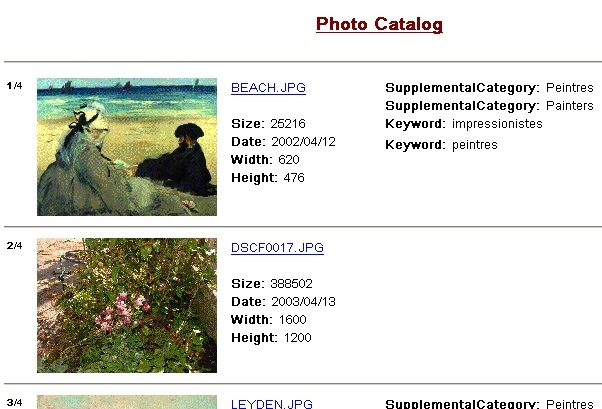 Allows you to create a catalog of hundreds of digital images stored on your disk; getting associated defined properties (such as a description, photographer's name, keywords, date, and category) and providing interesting search and selection capabilities. You don't need to add photos one by one into the database; the program scans specified folders and imports automatically the photo list with the associated information into the database. It is possible to create various databases. Keyword editor including Thesaurus for Graphic Materials I & II for subject headings terms. If you have family photos you can even use it as a genealogical resource to browse ancestors, search by birth date or any other IPTC field previously attached to photos. Search engine to find and manage your photos. Create a nice photo database, edit, and search IPTC headers.